From international bestselling author Posie Graeme-Evans comes the passionate tale of a woman ahead of her time. Ellen Gowan is the only surviving child of a scholarly village minister and a charming girl disowned by her family when she married for love. Growing up in rural Norfolk, Ellen’s childhood was poor but blessed with affection. Resilience, spirit, and one great talent will carry her far from such humble beginnings. In time, she will become the witty, celebrated, and very beautiful Madame Ellen, dressmaker to the nobility of England, the Great Six Hundred. Yet Ellen has secrets. At fifteen she falls for Raoul de Valentin, the dangerous descendant of French aristocrats. Raoul marries Ellen for her brilliance as a designer but abandons his wife when she becomes pregnant. Determined that she and her daughter will survive, Ellen begins her long climb to success. Toiling first in a clothing sweat shop, she later opens her own salon in fashionable Berkeley Square though she tells the world – and her daughter – she’s a widow. One single dress, a ballgown created for the enigmatic Countess of Hawksmoor, the leader of London society, transforms Ellen’s fortunes, and as the years pass, business thrives. But then Raoul de Valentin returns and threatens to destroy all that Ellen has achieved. 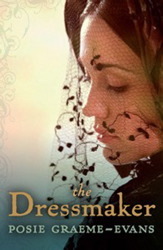 In The Dressmaker, the romance of Jane Austen, the social commentary of Charles Dickens and the very contemporary voice of Posie Graeme-Evans combine to plunge the reader deep into the opulent, sinister world of teeming Victorian England. And if the beautiful Madame Ellen is not quite what she seems, the strength of her will sees her through to the truth, and love, at last.